Description : Purchase online Mobile Phone Data Recovery software to safely recover deleted music files, missing songs, pictures, text documents etc from corrupted cell phones. 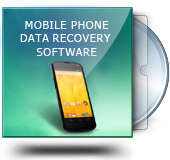 Mobile phone data recovery software recovers lost data from formatted mobile phone, logically corrupted memory card of cell phone and other data loss reasons. Mobile phone data recovery software successfully recovers lost data from formatted or reformatted memory card of your cell phone. Cell phone file retrieval program get back your missing or deleted data from logically corrupted memory card without modify them. Mobile recovery software is fully capable to restore lost files in major data loss scenarios like accidentally pressing the delete button, transferring data from one device to another, virus or spyware infected mobile phone memory card and other data loss causes.